A group of architectural firms will work with the City of Chicago to develop design concepts for a substantial new portion to the Chicago’s quickly developing riverfront. Mayor Rahm Emanuel, the Chicago Department of Planning and Development (DPD), and the Metropolitan Planning Council (MPC) announced the launch of the Chicago Urban River Edges Ideas Lab. The participating firms include David Adjaye, James Corner Field Operations, Perkins+Will, Ross Barney Architects, Sasaki, Site Design, SOM, Studio Gang Architects, and SWA. 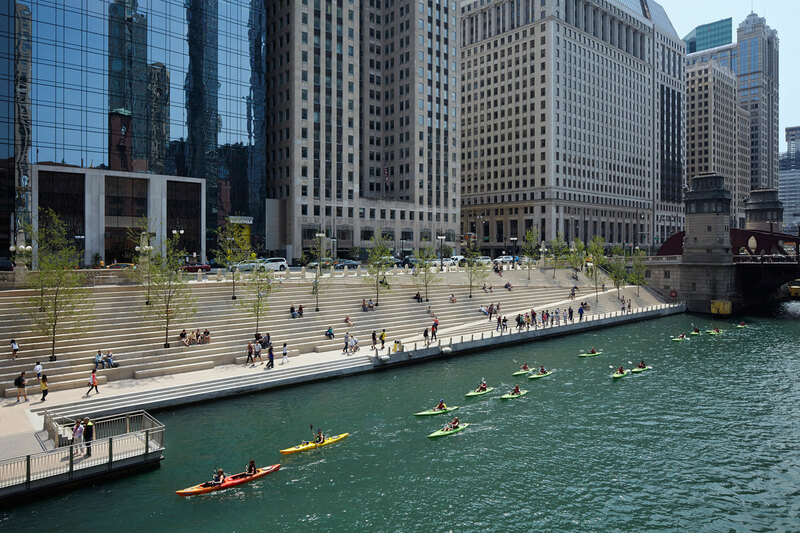 “Following the successful completion of the latest sections of the Chicago Riverwalk and with a number of riverfront developments in progress across the city, including the planning process for the North Branch Industrial Corridor around Goose Island, now is the perfect time to engage the architectural community to help us create new river edge guidelines,” said Mayor Rahm Emanuel. Each of the listed firms has extensive experience with designing award-winning riverfronts, public spaces, and parks around the world. The Ideas Lab will gather new concepts from the firms while engaging the local and global community for feedback. Each of the firms will submit more formal design proposals by June 2017, which will then be displayed to the public during the second Chicago Architecture Biennial. The information gathered throughout the process will also be used to inform the city’s riverfront design guidelines, which are planned to be released in 2018. Along with the physical exhibition, WSP Parsons Brnckerhoff, with support from Comcast, will produce digital exhibition components that will include augmented and virtual reality experiences (viewed via cell phones). Additional installations using California company Owlized’s virtual reality technology will also be developed. The Chicago Urban River Edges Ideas Lab will be funded by the Richard H. Driehaus Foundation and Comcast. The announcement by the city came as the Mayor, along with Anne Hidalgo, mayor of Paris, hosted an 18-mayor conference on to discuss the future of urban waterways. The conference, held in downtown Chicago, included input from Jeanne Gang.